In this article, we will explain how to calculate the number of shingles that you will need to complete a roofing project. Described are the two common methods for calculating the area of your roof. We will also explain how to identify the quantity of extra shingles that you will need for waste, overlaps, as well as starter shingles. As you probably know, composition shingles are sold both by the square and by the bundle. A square of shingles is defined as the quantity you will need to cover 100 square feet of roof surface. Shingles are generally packed in either paper or plastic bundles that are engineered to be light enough for a typical roofer to carry It follows that heavier shingles, such as the architectural ones require more bundles per square. Three bundles per square is typical of common three-tab strip shingles as well as lightweight laminated shingles. On the other hand, the heavier three-tabbed shingles as well as non-lightweight laminated shingles call for four or five bundles to per square. In the case where shingles are three bundles per square, you will find 29 standard-sized shingles, which are 12 inches by 36 inches. As you might expect, determining your roof square footage is how you figure how many bundles youll need to buy (not taking into account scrap). There are two commonly-used methods to measure a new or stripped roof. These are the sheet-count method and the measurement method. When laying new shingles over old ones there is a third method that is just as bit different. After coming up with the numbers for your principal roof area, you will need to add in extra shingles to for waste, starter shingles, and hip and ridge caps. On new or stripped roof the roof sheathing is exposed, in many cases you can just count the sheathing panels from the ground and calculate your footage from that. In most cases 4 foot by eight foot sheets are used equating to 32 square feet. Of course diagonally cut sheets nailed along hips and valleys are a bit more challenging, but with a little experience you can get the estimate fairly close. For shingles packaged at three bundles to the square, figuring out how many bundles to buy is elementary. Since a bundle covers slightly more footage than a sheet of sheathing simply buy one bundle for each sheet to err on the side of caution. If you will be working with other bundle counts per square, just divide the number of sheathing sheets by three. This will give you the number of squares that you will need to cover the roof. Why does this work? Because three sheets of sheathing come out to roughly 100 square feet, or one square. This method can be more accurate than the sheet-count method. In this case you will have to climb up on your roof and measure each roof section. In cases where all the roof sections are rectangles, just multiply the length by the width of each section. Next tally up the numbers of all sections. If your roof is too steep to walk on, so you need to get your numbers from the ground. If your roof is this type you can measure the length of your home on the ground and estimate any rake-edge overhangs. Next use a ladder measuring tape to calculate the eaves edge to the ridge. This is the one you likely want to use if your old shingles have not been stripped off and you are planning on applying new shingles over existing ones. 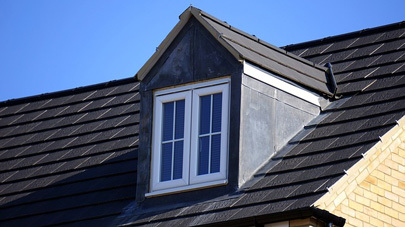 Start by measuring the length of the eaves of each roofing section. Depending on your situation take measurements either from roof-top or from the ground. Do this by taking your measurements of the length of your home and then add to that figure the width of your rake overhangs. One nice trick to use when your existing shingles are of the three-tab variety, just count the number of tabs along your ridges and eaves. This will allow you to calculate the length in feet because one tab is equal to one foot. Next, to determine the length of your rakes, simply count the courses of shingles beginning at the eaves and continuing to the ridge. Since the visible exposure on each course of shingles is 5 inches, just multiply the number of courses by 5 inches. Now divide by 12 to determine the length of your rakes. This will work fine if your shingles are standard 12 inches by 36 inches shingles and not metric measurements. Now when you multiply the length of your eaves by the length of your rake this will give you the area in square feet. If you order your shingles based on what we have already discussed you will come up short. Additionally you will need extra shingles for your starter courses on the eaves and in some situations along at rakes. You will also want to order shingles in order to cap hips and ridges. You will also need to allow for waste. There are a number of places where you will be cutting shingles such as at your rakes, against walls and chimneys, and at valleys. Some drop-offs will be large enough to utilize as starters or in other areas. Do you have additional tips on estimating material for roofing projects? Share them with our readers in the comment section below.